One Friday night, Ana Sorokina, a 33-year-old with intense brown eyes and a scarf covering her hair, lowered her head to recite a Shabbat prayer, marking the start of the day of rest for Jews around the world. It’s a ritual for Sorokina, a Muscovite who has embraced her Jewish heritage with a fervor in recent years. Although she is not orthodox, Sorokina keeps kosher, teaches Yiddish at several Moscow universities and is a member of Jewish organizations, including the e-club (the e is for evreisky, or Jewish), a group for people between 25 and 45 years of age and interested in exploring Jewish life through Shabbat dinners, weekend retreats and social service projects. There are an estimated 400,000 Jews living in Russia today (Orthodox Jewish leaders say the number is closer to 2 million) and many have taken advantage of their newfound religious freedoms. At the Nikitskaya Jewish Cultural Center in Moscow, both preschoolers and pensioners learn Hebrew and there are lectures, book readings and classes that fill the entire spectrum of Jewish life. Interest is so high, there is even a waiting list for their services, says director Regina Yoffe. 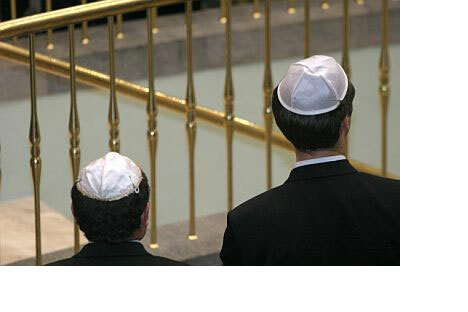 Many Russian Jews are still ambivalent about or even uncomfortable with religion, the product of 70 years of forced atheism and high rates of intermarriage. But they are also curious to learn about their heritage, largely because that part of their identity has long been an enigma to them and was often shrouded in fear and shame. Maria Murashova, 26, grew up in a typically atheistic home with an ethnically Jewish mother and a ethnically Russian father who defined themselves as Soviet intelligentsia above all else. But she was curious to explore her Jewish roots and went to Israel on a sponsored trip soon after finishing high school. Eventually, Murashova moved to Moscow and got a job working at the Nikitskaya JCC. “As a Jew, it’s important for me to ensure that all the Jews who are not affiliate right now…who are afraid of this Jew label, could be proud of being Jewish in Russia,” she said. In Moscow, St. Petersburg and perhaps a handful of other large cities, Jewish life is thriving. There are kosher restaurants, synagogues, yeshivas (Jewish religious schools) and even employers who are sensitive to the needs of observant Jews. Everywhere else, however, is a different story. When Rabbi Levi Kaminetsky, arrived in Tomsk, a town of 500,000 in western Siberia in 2004, he was dismayed to find a fragmented Jewish community where one had once thrived among exiles from Tsarist Russia and the merchants who catered to them. Kaminetsky, a member of the Chabad—a worldwide missionary Hasidic movement—set about rebuilding the city’s main synagogue and opening a Jewish community center and schools. But in a Jewish community of about 15,000, Kaminetsky estimates that only 500 attend synagogue on religious holidays and far fewer on a regular basis. Kaminetsky says his main goal is not to get everyone to be religious, but get them to “feel” Jewish, learning about the traditions and participating in holidays like Hannukah, Passover and Yom Kippur. Not all of Kaminetsky’s new neighbors appreciate his efforts. The synagogue, still in the process of reconstruction, has been vandalized several times with anti-Semitic graffiti and has had rocks thrown through the windows. But the biggest irony about Jews in today’s Russia may be that while the presence of Jewish organizations—both from overseas and homegrown—has increased, fewer people have remained to partake in them. Even among those who did not emigrate, interest is mixed.